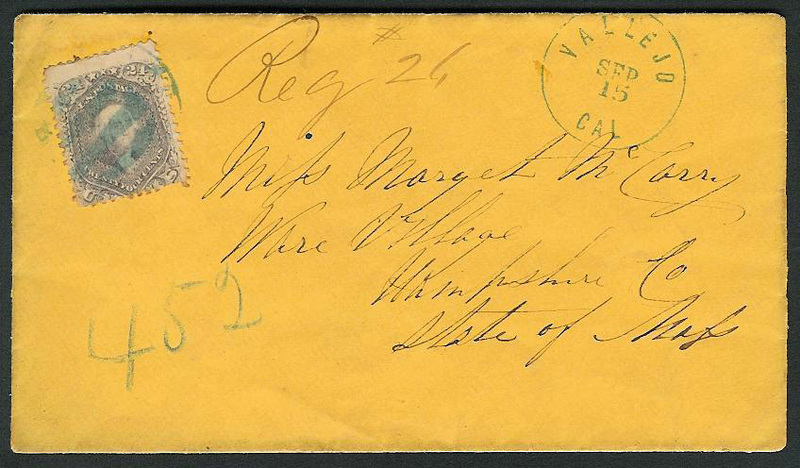 DESCRIPTION: An orange registered cover franked with a single 24 cent grayish lilac shade 1861 issue, perforated 12, postmarked with a blue VALLEJO/SEP 15/CAL cds, and canceled by a blue circular grid handstamp, with also a dark brown manuscript Reg #26 and blue crayon452, addressed to a Miss Margret McCarry, Ware Village, Hampshire County, Massachusetts. APPARENT USAGE: Fully prepaid 3 cents per half ounce domestic postage rate plus 20 cents registry fee, the latter being in effect between June 30, 1863 and December 31, 1968, with the letter overpaid by 1 cent. ANALYSIS: The franking on the letter appears to be a genuine 24 cent 1861 issue, Scott number 78, with some perforation staining as well as several short perforations and three missing perforations on the lower right edge. The cover is a genuine registered usage. However, the 24 cent stamp did not originate on this letter and is a replacement stamp for the original. The significant points of the analysis are: (a) the rim of the blue handstamp cancellation extends under a perforation near the top right side; (b) under black light there is a perforation shadow well above the top of the 24 cent stamp that does not conform with the shape of the top perforation tips; there is also a similar shadowing well to the left of the stamp; and (c) the blue ink of the handstamp cancellation appearing on the envelope does not match the blue ink appearing on the stamp, nor does the blue ink on the stamp match the blue ink of the cds. CONCLUSION: Originally, this registered letter was likely franked with a common 3 cent of the same 1861 issue, and the 20 cent registry fee was probably paid with cash. The original stamp was removed and replaced with a 24 cent, probably in an attempt to greatly increase the value of this registered usage.